I have discussed in a number of articles the issue of exclusive license and assignment for inventions. The distinction matters under Bayh-Dole because Bayh-Dole’s standard patent rights clause (37 CFR 401.14(a)(k)(1)) forbids nonprofit contractors from assigning subject inventions other than to an organization that has as a primary function the management of inventions unless it gets federal agency approval, and even then the assignment must carry with it the nonprofit obligations of the standard patent rights clause–including sharing royalties with inventors and using any profits after expenses for scientific research or education–things that might be nice, but not the things that most for-profit organizations are willing to do with their profits from a subject invention. A transaction becomes an assignment when the patent owner conveys “all substantial rights” in an invention to another. One way to do this is by assigning “title” to the invention. Another way, however, is to exclusively license the rights to make, use, and sell–the substantial rights in the invention. A slide deck by Joshua Rawson and Thomas Rayski on “Critical Mistakes to Avoid in Intellectual Property Licensing” [since removed from the Dechert site;Wayback Machine archived version here] provides a useful slide that lays out the situation. I’ve messed up their slide by circling the key categories. I’ve circled the two situations. In one, an exclusive licensee has “all substantial rights” and does not require the patent owner to bring a lawsuit to enforce the patent. In the other, the exclusive licensee lacks “all substantial rights” and the patent owner must join the litigation. 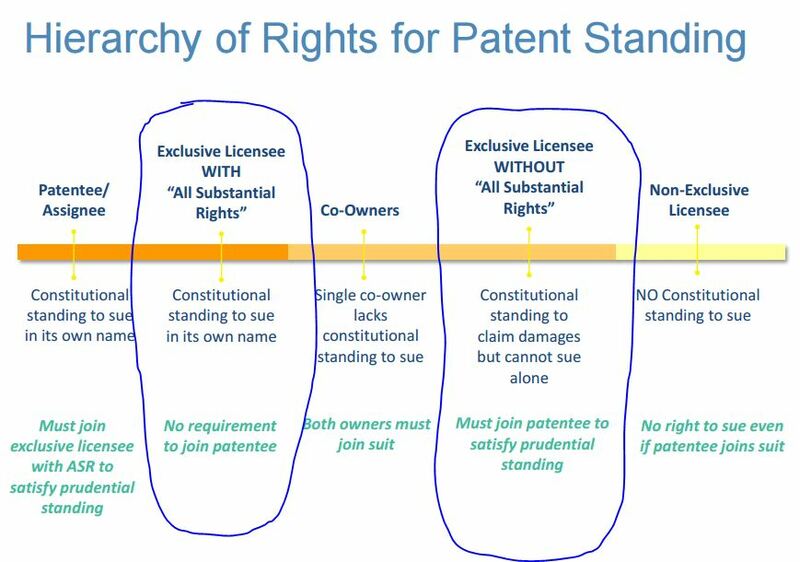 The critical rights that might lead a court into finding that an exclusive license grants all substantial rights are the rights to make, use, and sell, the right to sublicense, and the right to enforce the patent. The conveyance of all substantial rights constitutes an assignment. The broadest type of exclusive license grants a licensee the right to make, use, sell, offer to sell, and import the licensed product, or utilize the licensed process, in all relevant territories in all fields of use. This type of all-encompassing exclusive license is akin to an assignment. “Assignment,” in general, is the act of transferring to another the ownership of one’s property, i.e., the interest and rights to the property. . . . An assignment of a patent, or patent application, is the transfer to another of a party’s entire ownership interest or a percentage of that party’s ownership interest in the patent or application. In order for an assignment to take place, the transfer to another must include the entirety of the bundle of rights that is associated with the ownership interest, i.e., all of the bundle of rights that are inherent in the right, title and interest in the patent or patent application. Here’s the Supreme Court in Waterman v. Mackenzie (138 U.S. 252), from 1891 (citations removed and reformatted for readability). (3) the exclusive right under the patent within and throughout a specified part of the United States. A transfer of either of these three kinds of interests is an assignment, properly speaking, and vests in the assignee a title in so much of the patent itself, with a right to sue infringers. In the second case, jointly with the assignor. In the first and third cases, in the name of the assignee alone. Any assignment or transfer, short of one of these, is a mere license, giving the licensee no title in the patent, and no right to sue at law in his own name for an infringement. This Court further finds that its ruling upholds the policy for only allowing an assignee or owner to commence a lawsuit. That is, if both an exclusive licensee and a patent owner could sue separately for infringement, then an accused infringer could be subject to two suits on the same subject matter. Thus, it must be a single action, whether by the patent owner, the assignee, or both. The court also finds that the exclusive license amounts to an assignment–that’s how Ciba-Geigy has standing to sue for infringement (just as UC apparently wanted when it amended the license agreement). 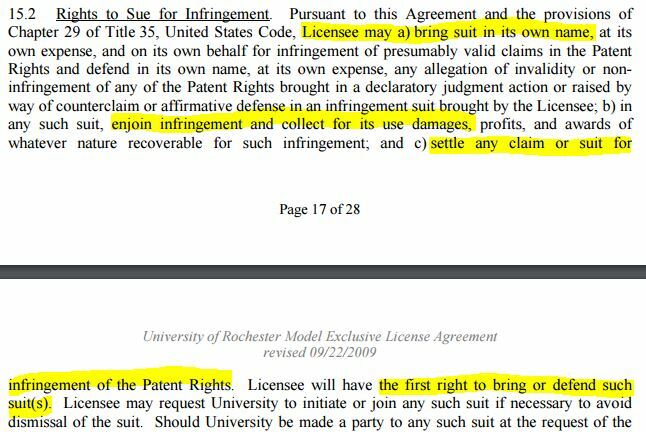 We will try to overlook the weirdness of how it is that the “Inventors of the Patent Rights” have any standing to reserve any right to use their invention, given that they have assigned their rights to the university. The Surgical Laser Technologies court looked at the reservation of such research related rights and U.S. government rights (licensed under Bayh-Dole’s standard patent rights clause) and determined that reservation of these rights did not constitute “substantial rights.” There’s always the possibility that the court was wrong (or that I’m wrong–hey, this is legal stuff, so why expect things to be, well, rational?). But the general drift is that the sample license grants all substantial rights and the reservations are inconsequential–education-related research, teaching, and whatnot. Just a restriction that no sublicense can “transfer the entirety of the rights granted”–so, rather like a prohibition on a particular kind of assignment–an assignment might involve all substantial rights for a specified territory, but not for all territories. So, the U.S. but not Rhode Island, say, or perhaps not Guam. What about the right to sue? It’s pretty clear that the license conveys the right to sue. Not only that, but it also gives the licensee the right to settle infringement (say, by granting a sublicense). That puts this sample agreement squarely in the left-hand category in Rawson and Rayski’s slide–the graphic here, to the left. That is, if the parties clearly intend that the exclusive licensee has the standing to sue in its own name, then they intend the licensee to have “all substantial rights.” And indeed, the license grants the exclusive rights to make, use, and sell (and to import)–what’s left for the licensor? Oh, education-related “uses.” Not substantial. This entry was posted in Agreements, Bayh-Dole, IP and tagged (k)(1), assignment, Bayh-Dole, exclusive license. Bookmark the permalink.